Digitisation may the buzzword that business leaders are trying to understand, but Microsoft has begun its journey to build a digitisation product portfolio. Every business will be a software business, according to Microsoft chief Satya Nadella (pictured). He said the internet of things promises to affect all businesses by making them software businesses. According to Nadella, every business should be looking at how it can be transformed through data. "Every business will become a software business, build applications, use advanced analytics and provide Saas services," he said. Nadella believes these activities will fundamentally change the economics of business, using what he called "systems of intelligence". GE has expanded its vision of an industrial internet to an industrial cloud. Building links between Interview: marketing and IT for the greater good. Many in the industry categorise such systems as systems of record. The web and the pervasiveness of mobile technology brought in a different type of system – the system of engagement, focused on digitising customer and partner interaction. Nadella described a new era of computing that could combine systems of record and engagement to improve an organisation’s intelligence. "Thanks to unlimited computing in the cloud, we are at the dawn of new business systems," he said. "We can build systems of intelligence, built on systems of record to create a feedback loop, driving performance and efficiency." Such applications convert static systems to intelligent systems, said Nadella, which is the area Microsoft will be focusing on. Remarking on the strategies of two of Microsoft’s biggest rivals, Google and Apple, he said: "Microsoft is very focused on empowering you across every vertical and size of business in any part of the world. We are not in this business because we have an ad business on the side, and we are not in the device business. "We want to create a new era of more personal computing – a ubiquitous computing fabric to create a more natural UI where you can speak to the computer and use holographic output." 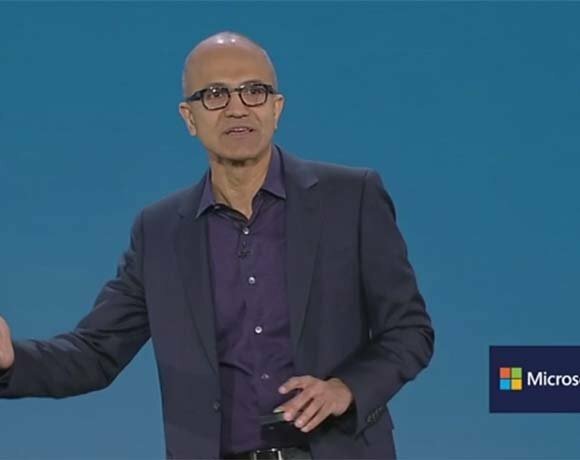 Nadella described some of the ways Microsoft would try to reinvent the integration of productivity linked to business processes. "The intersection between productivity communications, collaboration and business processes is where the most interesting things happen in your organisation," he said. "Microsoft Dynamics and Office 365 enable new workflows in the enterprise." He said Microsoft also wants to create a cloud that will work across industries and geographies. "We want to build a comprehensive cloud to support hybrid in its purest form to give flexibility and a rich data platform so you can create systems of intelligence to drive transformation," he explained. Nadella’s keynote reflects the latest thinking on how IT can remain relevant to business in the era of digitisation. Completely new businesses such as Hailo, the black cab app that runs on AWS, are disrupting traditional businesses. This is analogous to the late 1990s, when Amazon and eBay changed high-street retailing for ever. In response, traditional businesses are becoming more digitised. In Gartner’s 2014 CIO Agenda survey, 9% of the CIOs surveyed in the UK and Ireland said their organisation had hired a chief digital officer (CDO). Gartner research director Lee Weldons told Computer Weekly that this shows a real focus on digital business strategy by those organisations, with the CDO very forward-looking and investigating the strategic use of technology. Industrial and healthcare equipment manufacturer GE is an example of an organisation that is gradually shifting to a software-focused business model. It has created an industrial application platform called Predix, on which it is now building applications. In a recent interview with Computer Weekly, Bill Ruh, vice-president of GE Software, said: "We have created 40 applications. One of these, PowerUp in our wind turbine business, uses sensors about weather and turbine data to develop best practices to enable operators to generate up to 5% more electricity without physically changing it, which generates 20% more profit for our customers." Another example is an application to monitor oil pipelines, which is being used by Columbia Oil and Gas, said Ruh. “We are combining sensor data and data from assets that Columbia Oil and Gas has in other locations to create risk models," he said. "This allows us to assess the risk of any problem occurring by predicting where they will see problems on the pipeline." Such technology could help oil companies to build, repair and manage, safely and more efficiently, the two million miles of oil pipelines currently in operation, said Ruh. "This is the idea of the smart pipeline."